Linking Queens and Bronx in New York City, Interstate 678 crosses the East River on the Bronx Whitestone Bridge. Photo taken 08/29/05. Interstate 678 extends north along the Van Wyck Expressway from the terminal access road serving John F. Kennedy International Airport (formerly Idlewyld Airport). The urban freeway travels below grade by the South Ozone Park, Jamaica and Morris Park communities of Queens to the Kew Gardens Interchange with Grand Central Parkway and Jackie Robinson Parkway west. Continuing north along the Van Wyck Expressway, I-678 runs along the east side Flushing Meadow Park while Grand Central Parkway lines the west side to and beyond respective interchanges with I-495 (Long Island Expressway). The Van Wyck ends at Northern Boulevard (NY 25A), where I-678 turns northeast onto the Whitestone Expressway. 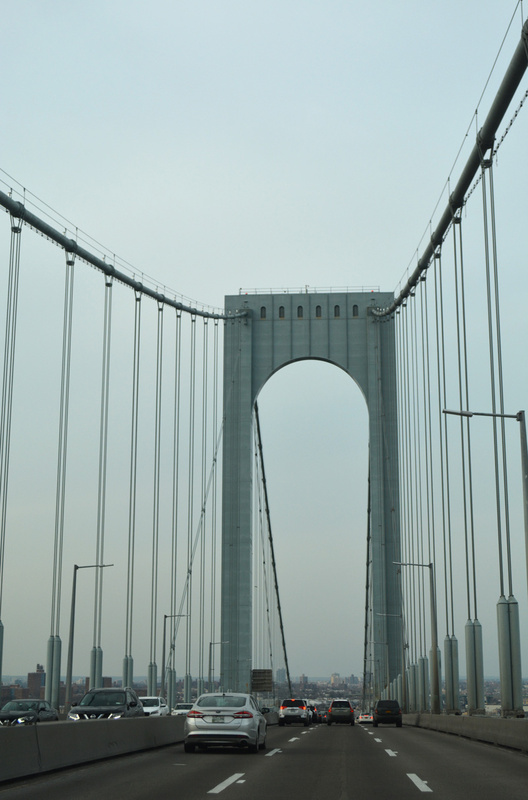 The Whitestone travels north to Malba, Whitestone and the tolled Bronx-Whitestone Bridge. Passing through Ferry Point Park, Interstate 678 enters the Bronx-Whitestone Bridge toll plaza and transitions to Hutchinson River Expressway. The freeway continues a short distance north to the Bruckner Interchange, where Interstates 95, 278 and 295 meet by Schuylerville. Hutchinson River Parkway takes over northward to Westchester County, Interstate 684 and the Merritt Parkway into Connecticut. Construction for the Bronx-Whitestone Bridge commenced in May 1937. Intended to provide relief to the nearby Triborough Bridge (Interstate 278), the suspension bridge opened on April 29, 1939. Interstate 678 was originally proposed as a loop south from I-95 (Cross Bronx Expressway) at the Bruckner Interchange to the Whitestone Expressway, and west along Northern Boulevard and Grand Central Parkway to Interstate 278 (Brooklyn-Queens Expresway West). The western leg of the loop was dropped from the Interstate system by AASHTO on June 23, 1969, when I-678 was redirected southward over the Van Wyck Expressway to Interstate 495 (Long Island Expressway). Prior to completion of the Van Wyck Expressway, the route outlined for Interstate 678 extended west from the Whitestone Expressway along Northern Boulevard to the BQE. Interstate 678 advances north from the Bronx-Whitestone Bridge toll plaza with five lanes to Exit 18 for Lafayette Avenue. The Bruckner Interchange with I-95 and I-278 follows. Photo taken 08/29/05. All truck traffic must depart from the north end of Interstate 678 to the Bruckner Interchange as the freeway mainline transitions into Hutchinson River Parkway. Trucks are prohibited from all parkways across New York City, partly due to low bridge clearances. Photo taken 08/29/05. Original button copy signs on the three-lane ramp from I-678 north to the Bruckner Interchange. Sign replacements made here designated the ramp for I-95 north to New Haven, Connecticut as Exit 19N and the subsequent ramps for I-95 south and I-278 west as Exits 19S and 19W respectively. Photo taken 08/29/05. Two lanes curve westward beyond the off-ramp for I-95 north to join elevated roadways for both the Cross Bronx Expressway to Manhattan and the Bruckner Expressway south to the RFK Bridge. Photo taken 08/29/05. An end shield for I-678 stood beyond the gore point for Exits 19N-S-W until 2002. The shield was eventually replaced with an erroneous north I-678 confirming marker. Hutchinson River Parkway continues northward from the Bronx to the suburbs of Mount Vernon, Pelham and New Rochelle. Photo taken by Steve Anderson (10/98). A Breezewood style connection leads southbound motorists on Hutchinson River Parkway to both Interstate 95 (Cross Bronx Expressway) south and I-278 (Bruckner Expressway) west from upcoming Exit 1. The parkway mainline transitions into Interstate 678 en route to the Bronx-Whitestone Bridge at the Bruckner Interchange. Photo taken 08/29/05. Exit 1 leaves Hutchinson River Parkway southbound beyond a small service plaza along side Westchester Creek. The off-ramp ties into the Bruckner Boulevard frontage road system ahead of on-ramps to I-95 south, I-278 west and I-678 south. Photo taken 08/29/05. Interstate 678 begins as Hutchinson River Parkway transitions to freeway standards. There is no access from Exit 1 to either I-95 (Bruckner Expressway) north or I-295 (Cross Bronx Expressway Extension) south from this direction. Photo taken 08/29/05. Former button copy guide signs using the original mile based exit numbering system for the Cross Bronx Expressway, posted one quarter mile ahead of the Bruckner Interchange at Castle Hill Avenue. Photo taken 08/29/05. Exit 6A forms a collector distributor roadway from Interstates 95 north and 278 east to both I-678 (Hutchinson River Expressway) south and Interstate 295 south. Photo taken 08/29/05. There is no access to the Hutchinson River Parkway leading north from Interstate 678, as I-95 will meet the parkway further north along the New England Thruway, I-678 otherwise extends the parkway south as a full freeway to the Whitestone Bridge at Old Ferry Point. Photo taken 08/29/05. Interstate 678 spans the East River southward to Whitestone and Malba, where it ties into the Cross Island Parkway east and Whitestone Expressway south. Photo taken 08/29/05. Interstate 278 (Bruckner Expressway) travels through Unionport on the half mile approach to the Bruckner Interchange with Interstates 95, 295, 678 and Hutchinson River Parkway. Photo taken 08/09/04. The Cross Bronx Expressway shifts southward to become Interstate 295 as I-95 overtakes the Bruckner Expressway northeast to the New England Thruway. Interstate 678 (Hutchinson River Expressway) travels north-south below the transition. Photo taken 08/09/04. Exit 54 partitions from the Bruckner Expressway mainline to first split with an at-grade frontage road for Zerega Avenue and Hutchinson River Parkway north. Two lanes ascend across Westchester Creek to both Interstates 678 and 295. Photo taken 08/09/04. A flyover spans the distributor roadway from I-95 (Cross Bronx Expressway) north to the upcoming ramp for Interstate 678 south for the Whitestone Bridge. Photo taken 08/09/04. Spanning Westchester Creek and Brush Avenue, traffic separates with two lanes joining the Interstate 295 (Cross Bronx Expressway) mainline south to Locust Point and two lanes joining I-678 (Hutchinson River Parkway) south to Ferry Point Park. Photo taken 08/09/04. Interstate 678 (Van Wyck Expressway) meets New York 27 (Conduit Avenue), Belt Parkway and New York 878 (Nassau Expressway) east at a directional cloverleaf interchange (Exits 1-1E) on the north side of John F. Kennedy International Airport (JFK). Conduit Avenue forms the frontage road system for Belt Parkway, while the Nassau Expressway comprises a one-way freeway eastbound to cargo areas of JFK Airport. Photo taken 08/29/05. Exits 1-1E partitions from the left-hand side or I-678 south for Belt Parkway and NY 27 (Conduit Avenue) east to Nassau County. 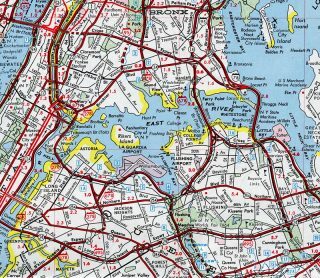 This exchange represents the western terminus of Interstate 878, the unsigned counterpart of the Nassau Expressway east to Rockaway Boulevard. Photo taken 08/29/05. The Van Wyck Expressway continues south to a right in right out (RIRO) connection with 150th Avenue as Interstate 678 reaches John F. Kennedy International Airport. Most maps show I-678 posted southward into the airport, but New York State Department of Transportation (NYSDOT) maintenance ends at this point. Photo taken 08/29/05. The Port Authority takes over maintenance for Van Wyck Expressway within John F. Kennedy International Airport (JFK). The freeway next navigates through Federal Circle, a rotary interchange with access to rental car facilities and adjacent industrial areas. Photo taken 08/29/05. Three lanes curve southward from the 130th Place off-ramp to long terminal parking and the Port Authority Administration toward the numbered terminals of JFK Airport. Photo taken 08/29/05. Leaving John F. Kennedy International Airport (JFK), maintenance along the Van Wyck Expressway shifts from the Port Authority to NYSDOT. The ensuing exit along I-678 northbound serves both NY 878 (Nassau Expressway) and Belt Parkway (Southern Parkway) east. Photo taken 08/29/05. The roadways for I-678 diverge beyond Federal Circle for the ramps to Belt Parkway and Nassau Expressway east. New York 878 (unsigned I-878) is a remnant of the once proposed route taking I-78 east from the Bushwick Expressway to the Clearview Expressway. Photo taken 08/29/05. Interstate 678 travels north with three lanes toward Jamaica and Kew Gardens as Exit 1A departs for NY 878 east to Rockaway Boulevard and the Belt Parkway to Nassau County. Photo taken 08/29/05. A collector distributor roadway extends north from the Belt Parkway and Conduit Avenue (NY 27) to the Rockaway Boulevard overpass. The first confirming marker for Interstate 678 follows along northbound. Photo taken 06/06/05.